My front garden today - 20th April.2010. You have such a colourful garden TT. It must be a pleasure to spend time in it. Lovely patchwork of plants/colours, TT, a real eye-catcher. A real credit to you. So much lovely spring colour! Fantastic TT!! oh, and a lovely easter bonnet too by the way! Your garden is stunning TT, love it. Breathtaking Terra the colours are dazzling! gone on my favourites! I'm concreting and scrubbing pavings in the back garden today, but will be back on GoY soon..... exhausted...LOL. Thats amazing, what a lovely time of year this is. Terratounie! It's a personal paradise!! Stunning! So pleased you like my garden..
What a blaze of Spring colour Terratoonie. It's still cold outside although Gerry and I found a place near the greenhouse out of the wind and in the sunshine this morning to have our cuppa!! Gorgeous TT. What a spring delight! Wonderful....so much colour and new life ! Stunning TT....do you add plants to this each year or do they just multiply and grow? Richard the plants are aubrieta, and the little yellow/orange flowers are violas..
Another stunning photo TT - I could sit there all day and not want to go anywhere ... !! I'd love to TT - but it's a bit difficult at the mo' getting flights out !! Mmmmm chicken dinners - I bet they're fluent in French by now !!!! This is really one for lifting the spirit TT, its beautiful. Hello What a lovely garden you have, the colours are lovely, its definately got the wow factor and so pleasing on the eye far better than having to look at hard standing areas for cars, on the road where i live its sad to see all the front gardens disapearing for the sake of car space, when we bought our house twenty two years ago the front garden was hard standing, our first job was to clear all this away and make a garden, and now its a picture, i have rambling roses, ribes,kerria, sumac hebes berberris, and euonymous, its congested but beautifull, i dare say it soon will be the only front garden on our road. I agree Julien, I am the only one in my close to have a proper front garden, but we can perhaps lead the way and hope some will follow! love this garden what a picture! Yes, it would be a pity if too many front gardens turned into concrete ..
Aubrieta are very common in the gardens around here. Did anyone see the lovely Aubrieta that Carol planted in her garden in Devon during the last episode of Gardeners World? I thought it looked really lovely! This looks so colourful - and so welcome after the winter we've had. I have worked outside all today and my face is tingling with sunburn!!! Wallis seeds do a packet of aubrietia for 90 p, they do a mixed packet and a trailing type. I am gorwing the mixed packet this year. I had a packet of mixed alpines when I first started this garden five years ago and there where aubrieita in there when i dug the bed to improve the soil last autumn i thought i had lost them, then yesterday i was weeding the bed and i thought that looks like an aubrietia and it was, so i think now they are indestructable! Some welcome rain today after a busy, happy, sunny day in the garden yesterday. Yes I agree it is always interesting to see the colours when they bloom, it is a very exciting time, can't wait!! how did you start this of and how long b 4 it got looking like this. i want to do sum thing like this on banking . WOW!!! You've out done yourself! : > ) I want a garden like yours. It's so colorful with all those beautiful flowers. What an inspiration you are to one and all, absolutely stunning....TT. Respect ! 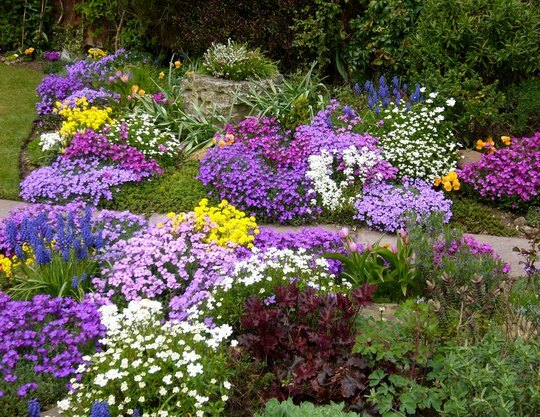 I would love my garden to look like this - you must work hard so I really hope you enjoy your special space - like a lot of the comments you are an inspiration to us all. Your own gardens are lovely. Can't believe what I see here :o) The most colourful garden I've ever seen. You're a real Master!!!! Hi Arun... thanks for the gasp :o) lol. This is amazing the colours are fantastic. Hi Terratoonie,very Stunning and amaizing front garden you have there,I like it . Hi Terratoonie my friend and I were just admiring your garden we are new to this gardening lark and wondered what the yellow flowers were amongst the pinks and purples? I can't recall the full name at the moment ..
And this one . Just stunning! I love the way you mix colors. Everything just seems to go together. Thanks for the inspiration. What a lovely show! Wanted to grow aubrieta from seed this year. You've definitely given me more incentive. It looks so pretty so early on in the year, so colourful without the help of any bulbs which don't end up looking so pretty when the flowers are gone and they are dying back. Very good idea! This pic is mostly aubrieta and grape hyacinths (muscari). What is the yellow n white one next to aubrietas on this picture?please. This is so beautiful..trying to copy this. Need your advice,thanks. Hello again, and thank you for your response to my PM; this is the photo I was looking at - top right and half-way up on the left is what looks like grape hyacinth, but larger and more compact than I have come across before? Thank you for your time. love it, so colourful, aiming to get something similar in my little side garden, if i achieve half a good a result as your display i'll be pleased. Thanks for inspiration on a dull Feb afternoon! I think you're meaning the alyssum ?